The name Aleksandr Bolshakov may not be one of the best-known among Martial Arts fans around the globe but that could all be about to change. RT’s Konstantin Potapov caught up with the man who's regarded as Russia's hottest fight prospect today. Russia has been synonymous with producing world-class fighters for many years. Various disciplines in various martial arts have seen Russians dominating ring, mat and octagon. Batu Khasikov is one such fighter. The undisputed world kickboxing champion was recently invited to the prestigious K-1 world series after winning every belt he had fought for. Another is mixed fight legend Fedor Emelianenko. The 34-year-old Last Emperor may be in the twilight of his career now after losing two consecutive bouts but he's still undoubtedly one of the greatest fighters plying his trade today. Emelianenko's former coach Ruslan Nagnibeda believes the next global star of the combat game is in his corner. 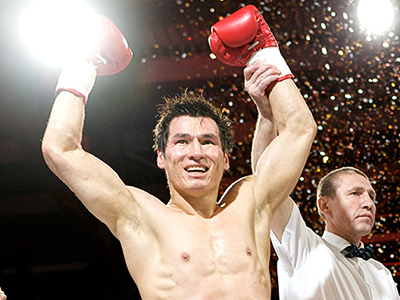 Aleksandr Bolshakov is a Thai boxer by definition but he is ready to knock down the K-1 door. “I have been training Bolshakov for more than a year. A good pupil deserves a good coach and vice versa. When I started to train him I had to change his technique a little, but his punching and kicking style is now as good as anyone's. His hits are so powerful that sometimes after training I can't feel my hands,” says Nagnibeda. Bolshakov has had 11 K-1 qualifying bouts, winning 10 of them and drawing one. With a flashy style featuring flying knees and kicks, the 27-year-old outclassed the competition to claim the European crown last year. A world crown is now top of his agenda. “First of all, I want to become the best on the planet. And then we will get an opportunity to hold a title defense fight in Russia. Because if you win you dictate the terms. And hopefully that will happen,” Aleksandr says. Bolshakov has been addicted to martial arts since he was 10, each year making impressive progress with regional and national title belts added around his waist. But for almost a decade it’s all been about K-1 for the St Petersburg native. “In Germany and the Netherlands for example, fighters are paid by their federations. That's why we don't have a lot of athletes as all of them have to earn money, so instead of training they stay in the office. Foreign fighters are fully focused on honing their skills. I hope my success will help to establish a section of K-1 here, and that Russian fighters will get lots of opportunities to develop,” he explains. The policeman, who specializes in drug enforcement, believes that if a federation actually starts up in his native country, his rise up the pro K-1 ranks will happen sooner rather than later. And that is sure to be a very important step in developing the sport in martial-arts crazy Russia.